Yamaha is a company that has rediscovered two channel. Having allied itself rather strongly with home cinema over the past decade, it has come back to its roots with the vigour of the born again. Maybe someone in the boardroom started listening to music again! This resurgence has spawned some superb-looking separates and is now filtering down into smaller systems, like the MCS-1330 separates that are sold together and are designed to deliver decent sound from easy to use and attractive hardware. 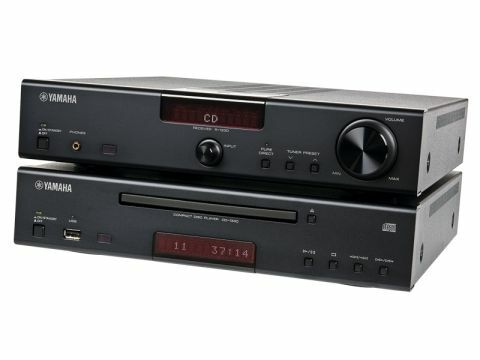 MCS-1330 is the name that Yamaha appends to the electronics under consideration here and this review includes the R-1330 receiver and CD-1330 CD player. We used these with Yamaha's NS-BP400 speaker system. Both components are extremely well finished in three-quarter-width cases that when stacked together, stand a little higher than your average full-size amplifier. Yamaha is clearly going after the territory Denon has aggressively jumped into and TEAC staked out a while back with its gold bricks. As for features, Yamaha has held back on chucking in everything it can and stuck with the key options required in this sector. Specifically, an iPod dock with full remote functionality, an FM tuner, and a CD player that will spin MP3 and WMA-encoded discs. The only notable absence is DAB, which can be found on the competition at this price. There is a front panel USB input, but it's designed for 'mass storage devices' like flash memory keys and MP3 players rather than a PC, which seems an odd approach. Speaker terminals are good quality and will accept 4mm plugs if you prise out the plastic caps and there are RCA phono inputs for a turntable and a line level source such as a DVD player or set-top box. Using the FM tuner with the supplied twisted wire antenna can be a little challenging. The aerial can't pull in a completely clean signal for stations like Radio 2 and the auto presetting process stored about 27 non stations as it scanned about a third of the band. A decent antenna may be a necessity in some situations – it's useful to have so many presets, though. The process is pretty straightforward once you have read the manual and given up on trying to set them all by wit alone. With a clean signal and the audiophile's station of choice, Radio 3, the results are very good with the fine imaging qualities of the medium demonstrated in full effect. For our test, we used the amplifier with a pair of Cyrus CLS50 speakers and connected the two Yamaha units with the supplied interconnect. The system has a Pure Direct mode, which dims the displays when engaged. The pairing puts in a taut and fairly revealing performance on CD, with a reasonably open and clear sound and average detail levels for the price. It doesn't have the timing of regular separates, nor their dynamics, but there's enough bounce in its step to get your toe tapping, while vocals are not too vague in placement and shape. We compared it with a relatively old alternative, albeit a more expensive one in its time. This put the Yamaha in a significantly better light thanks to its decent bandwidth and appealing openness, a combination that made bands like the ill-fated Trio of Doom (McLaughlin, Pastorius, Williams) sound more substantial and three-dimensional via some Dali Menuet speakers. This is a nicely turned out pairing that provides an alternative aesthetic to the competition. It won't trouble full-size separates at the price but that's not its purpose. Instead, it provides decent sound quality and represents a big step up from budget units. What's more, it doesn't try to blind you with features.